The ultimate way to cruise Asia in modern luxury - Here is where you’ll explore pristine beaches, exotic landscapes and vibrant cultures, all from the comfort of our modern, luxurious Celebrity Millennium. Combining the contrasting urban splendor of Shanghai, Beijing and Xian with the majestic sights of the Great Wall, Terracotta Warriors and extraordinary landscapes of the Li River, Wendy Wu showcases China’s most glorious highlights. A tour introduction will be held in the hotel either this evening or the next. Food and drinks will not be served at this meeting, it is simply an opportunity for your group to meet and learn more about travelling in China. Today’s explorations include the peaceful Yu Gardens, the atmospheric alleys of the old town and a visit to the Silk Museum. Sightseeing involves a full day of touring around the centre of the city with three to four hours on foot. Later, cruise on the mighty Huangpu River for stunning night vistas, before dining tonight on traditional Shanghainese cuisine. 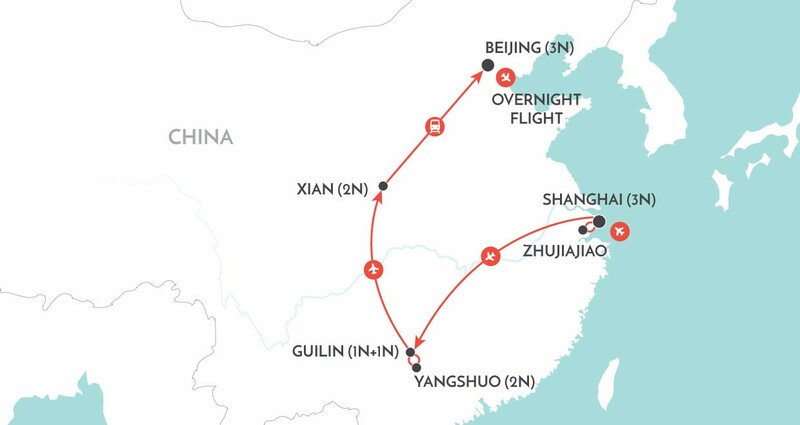 Fly two and a half hours to the scenic city of Guilin. On arrival, enjoy some light sightseeing, including Seven Star Park which is located on the banks of the Li River. 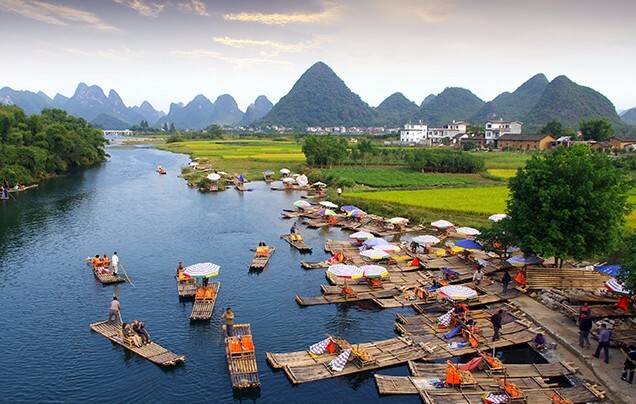 Take a relaxed four hour cruise along the Li River to the charming village of Yangshuo where you will spend two nights. Around every river bend is a view to take your breath away as jagged peaks loom over rural scenes of lush greenery, grazing buffalos and local fishermen. These are small cruise boats usually holding approximately 100 passengers; with an enclosed dining area on the lower deck and an open viewing area on the upper deck. As it is so popular, there are generally many boats at the docks – please be reassured that the cruise itself will be scenic and relaxing as the boats cruise past unspoilt countryside. Spend a morning exploring the verdant countryside of Yangshuo. Walk by lush paddy fields and slow-moving water buffalos as you admire the panoramic mountain scenery that so epitomizes the area. This afternoon is at leisure. There are many activities to take part in including cycling, rafting and walking (arranged locally and at extra cost). Drive one hour back to Guilin. Enjoy a leisurely walk around Ronghu Lake and a visit to the Sun & Moon Pagodas for spectacular views over downtown Guilin. Take a tour of the South China Pearl Museum where you will have the opportunity to buy these precious stones. Stop for a photo opportunity on the banks of the Li river and meet a genuine cormorant fisherman. Transfer to the airport for your flight to Xian, China’s ancient capital. Visit the lovely Little Wild Goose Pagoda, involving approximately one and a half hours on foot. This evening you will feast on traditional Shui Jiao dumplings, before enjoying a performance of Tang Dynasty dancing. Xian has long played a pivotal role in China’s extensive history and has been a thriving hub for cultural exchange, economic trade as well as national politics for centuries. Home to some of China’s most ancient sights, diverse architecture and delicious fare, Xian is a must-see destination. Spend the morning viewing the enigmatic ranks of the life-sized Terracotta Warriors. Within the museum area the warriors can be seen in three different ‘pits’, which are active archaeological digs. The site is large and will take about two and a half hours to explore. After this, visit the Xian Art Ceramics and Lacquer Exhibition centre to see smaller models of the warriors being made. Later, stroll on the beautifully preserved 14th century city walls that enclose Xian’s old town. 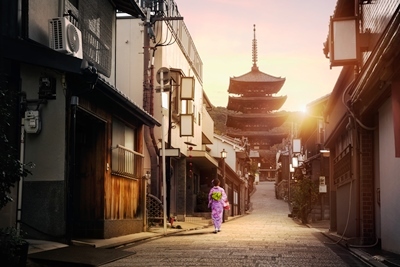 The local guide will give you time to explore the ancient city walls at your own pace. There are options here to hire a bicycle or an electric cart to drive along the length of the wall. These are offered by private vendors and can be organised at your own expense. Board your bullet train to Beijing, China’s capital. Your train will be in a second-class soft seater and four to five hours. Later, take a 40- minute rickshaw ride through the warren-like hutongs where you will visit a local family to learn about local traditions and culture. Spend your evening soaking up the atmosphere of this fascinating city. Visit the Great Wall of China, appreciating the wall itself and the dramatic scenery. Great Wall’s unique history you will have approximately two hours of free time to explore at your own pace. Later, visit the Jade Museum. This afternoon, wander around the Summer Palace. This evening, enjoy a Chinese acrobatic show. Soak up the harmonious ambience of the Temple of Heaven where you can watch, or take part in, an outdoor dance group. Walk across the lengths of Tiananmen Square and into the magnificent Forbidden City, involving three to four hours on foot. This evening, feast on the city’s most famous dish – Peking duck. Prices listed are per person in Australian Dollars, based on twin occupancy, including all discounts unless otherwise stated. The offer is subject to availability at time of booking and shown on the lowest inside category available at the time onboard Celebrity Millennium. Fares are capacity controlled and are subject to change at any time without notice. Prices/Offers are correct as at 16 July 2018 and can be withdrawn without notice. Cabin categories include prepaid government fees and port taxes unless otherwise stated. Hotels may charge resort fees not included in this package, payable direct upon check in. Includes 2x AU China Group Visa Single (Australia Passport holders only) . Airfares are based on economy class flights from Sydney and subject to the carriers’ flight schedules and conditions, please call us for prices from other cities. Payments made by credit card will incur a surcharge.